Note: Roads in blue (major road thick line), Border French/Dutch Side in red. Only the major beaches (yellow) indicated. Use the tabs above to view an interactive Google map with villa, condo, and hotel locations. 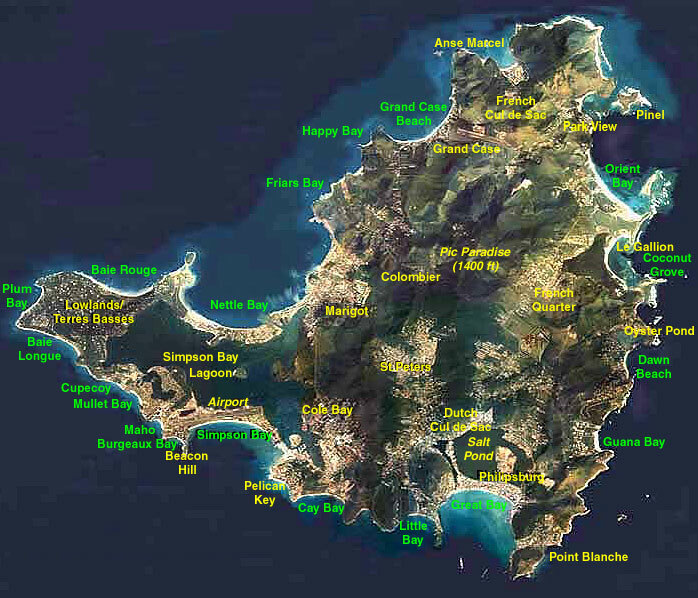 We also schematic 'point&click' maps of the Terres Basses/Lowlands and Orient Bay with villa locations. The backdrop of the first map is made by Wim ter Hart. You can order this aerial photo from his website. But feel free to to print it and use it on your trip to St.Maarten/St.Martin. If you want to use the map for other purposes please contact us first.